[SatNews] Because the liftoff mass is greater than 20 metric tons necessitates that its separation from the launcher is planned for nearly one hour and four minutes after this July 29 liftoff. 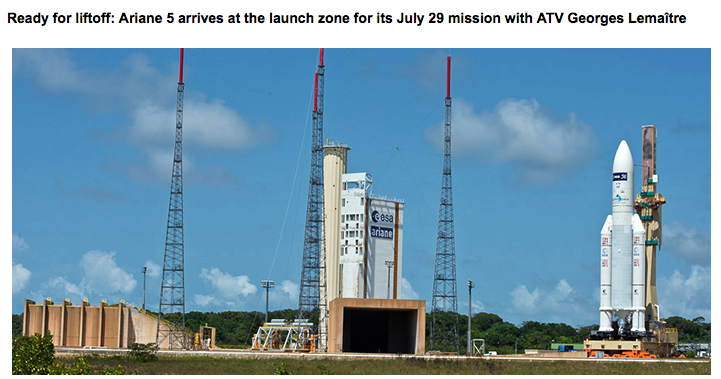 The Ariane 5 with its record-setting payload has rolled out in French Guiana, marking a key step ahead of Arianespace’s fifth, and final, mission to launch an Automated Transfer Vehicle (ATV) for servicing of the International Space Station. With ATV Georges Lemaître protected by its ogive-shaped payload fairing, Ariane 5 approaches the launch pad to complete today’s rollout. Emerging today from the Spaceport’s Final Assembly Building, the Ariane 5 was transferred on a mobile table to the ELA-3 launch zone—where it is now poised for tomorrow’s liftoff. This launch is set at the precise moment of 8:47:38 p.m. local time in French Guiana, which has been calculated for its orbital phasing to rendezvous with the crewed orbital facility. Having a liftoff mass greater than 20 metric tons, the ATV, named after Belgian physicist Georges Lemaître, will be the heaviest-ever payload orbited by an Ariane 5 launcher, and is to be deployed into a circular orbit at an altitude of 260 kilometers, inclined 51.6 degrees. Its separation from the launcher is planned for nearly one hour and four minutes after this July 29 liftoff. When factoring in Arianespace’s previous four ATV flights, with “Jules Verne” (March 2008), “Johannes Kepler” (February 2011), “Edoardo Amaldi” (March 2012) and “Albert Einstein” (June 2013), the Ariane 5 ES version used for these resupply missions will have lofted more than 100 metric tons into orbit for the International Space Station. ATV Georges Lemaître is to deliver fuel, air and more than 2,600 kg. of dry cargo to the facility, as well as perform maneuvers to maintain the station’s nominal orbit and test new rendezvous sensors in space. Managed by the European Space Agency, the ATV program is part of Europe’s contribution to the International Space Station’s operation. Airbus Defence and Space, which also has the role as Ariane 5 industrial architect, is the Automated Transfer Vehicle’s prime contractor, leading a European industry team.